Symposia H, 'Organic Photovoltaic Devices and Processing', and I, 'Fundamental Processes of Solar Harvesting in Excitonic Solar Cells', were co-ordinated to create an organic photovoltaic super symposium at the 2011 MRS Fall Meeting in Boston from November 28–December 2. Exciting advances were reported in the conference, including achieving 10% energy conversion efficiency, both a psychological barrier and a milestone in organic photovoltaics. The relevance of organic photovoltaics has steadily increased in consumer applications with aesthetics, mechanical flexibility and buzz value. Broader commercial adaptation, however, remains elusive in the face of increased competition from inorganic counterparts. The enduring challenges of stability and efficiency will ultimately determine the future application of organic photovoltaics and its broader societal impact. 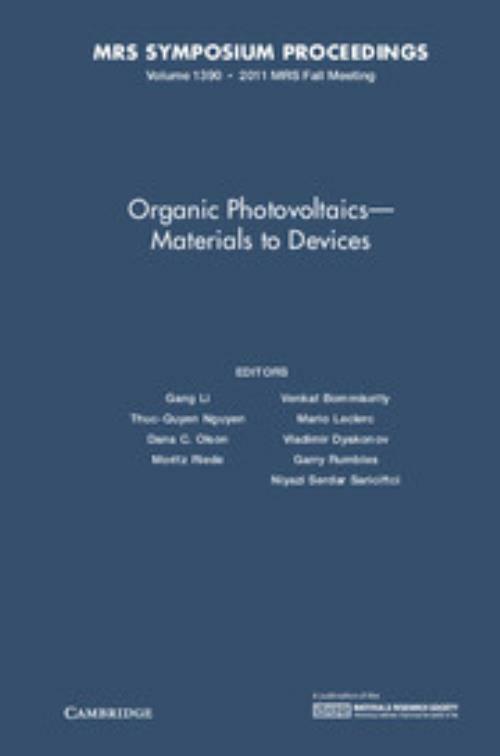 This volume presents a glimpse of the wide variety of topics presented and discussed, ranging from fundamental processes behind photosynthesis to materials processing and characterisation, and engineering state-of-the-art solar cells. 27. Atomistic simulation of dissipative charge carrier dynamics for photocatalysis. Gang Li University of California, Los Angeles. Thuc-Quyen Nguyen University of California, Santa Barbara. Dana C. Olson National Renewable Energy Laboratory, Golden, Colorado. Moritz Riede Technische Universität, Dresden. Venkat Bommisetty South Dakota State University. Mario Leclerc Université Laval, Québec. Vladimir Dyakonov Julius-Maximilians-Universität Würzburg, Germany. Gary Rumbles National Renewable Energy Laboratory, Golden, Colorado. Niyazi Serdar Sariciftci Johannes Kepler Universität Linz.